Are you a busy multi-tasker just like many other Polycom VoxBox users? If yes, then you will love Polycom’s VoxBox conferencing speakerphone! The VoxBox allows you to pair with up to 10 devices and connect with up to 2 devices at the same time, making it a perfect conferencing speakerphone for huddle spaces and anywhere you travel. Today we are going to show you how to pair your VoxBox with multiple Bluetooth devices. Let’s get to it! Press and hold the Bluetooth button until the status indicator flashes blue. Now you are in the “Pairing Mode”. On the device you want to pair with, select “Polycom VoxBox” from your Bluetooth pairing list. You are all set! Note that, although you can pair with up to 10 devices, the speakerphone can only transmit audio for one device at a time. If you want to switch to a certain device, just make sure you disconnect the VoxBox from other devices under Bluetooth settings. Have you tried Polycom’s VoxBox? What was your experience? Share with us! 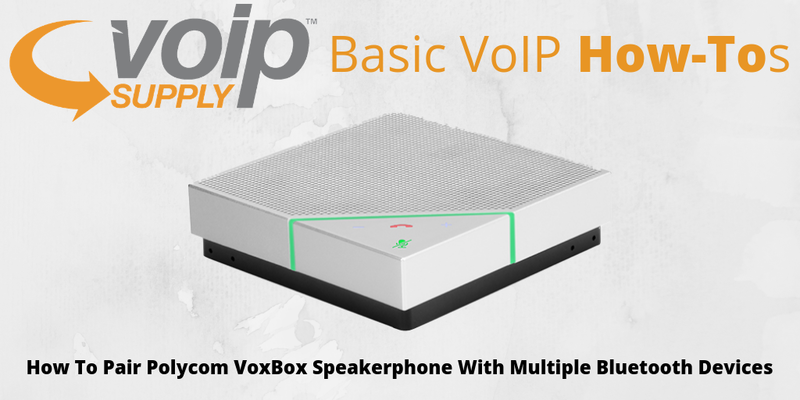 If you’re interested in learning more about the Polycom VoxBox, visit our product page here!